The Fellowes Powershred 60Cs is a cross-cut shredder capable of taking up to 10 sheets of paper at a time. It shreds sheets into 4x50mm particles and has a P-3 security level rating (great if you need to shred confidential documents). Bin size is a very good 22 litres and the shredder has a lift-off head, so is easy to empty. 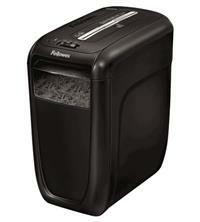 The Fellowes 60Cs will get through small staples and paperclips, so there is no need to remove these before shredding. It will also shred credit cards which can come in very handy if you want to securely shred things like old bank cards. The shredder can be used in the home or small office and comes with the following handy features: SafeSense technology which immediately stops the shredder if hands touch the paper entry; an overheat indicator to tell you the shredder has exceeded its maximum operating temperature and needs to cool down; and a reverse function to help clear any paper jams.